Mikhail Sholokhov is arguable one of the most contentious recipients of the Nobel Prize in Literature. As a young man, Sholokhov's epic novel, Quiet Don, became an unprecedented overnight success. Stalin's Scribe is the first biography of a man who was once one of the Soviet Union's most prominent political figures. Thanks to the opening of Russia's archives, Brian Boeck discovers that Sholokhov's official Soviet biography is actually a tangled web of legends, half-truths, and contradictions. 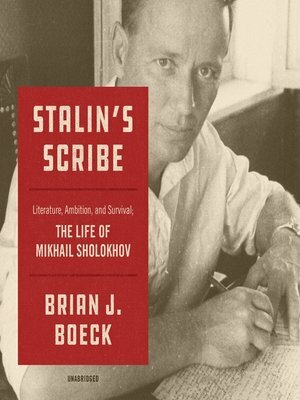 Boeck examines the complex connection between an author and a dictator, revealing how a Stalinist courtier became an ideological acrobat and consummate politician in order to stay in favor and remain relevant after the dictator's death. Stalin's Scribe is remarkable biography that both reinforces and clashes with our understanding of the Soviet system. It reveals a Sholokhov who is bold, uncompromising, and sympathetic-and reconciles him with the vindictive and mean-spirited man described in so many accounts of late Soviet history. Shockingly, at the height of the terror, which claimed over a million lives, Sholokhov became a member of the most minuscule subset of the Soviet Union's population-the handful of individuals whom Stalin personally intervened to save. Brian J. Boeck holds a PhD in Russian history from Harvard University and has taught Russian and Soviet history for over a decade at DePaul University. He is the author of Imperial Boundaries and lives in Chicago.